Are your business signs in Thousand Oaks landmarks of the local scenery? If not, they could be very well designed and placed in strategic locations, but something might still be wrong. The right kind of signage can turn heads. With some things, bigger is better. When you decide to increase the size of your signage, it is going to attract more attention. In addition, it attracts attention from a greater distance. However, it is important to be familiar with the laws and ordinances for signs in Thousand Oaks before making any major changes. So what’s the best way to “go large”? When you come to Dave’s Signs, you receive complete services. We design signage to perfectly matches your business needs. 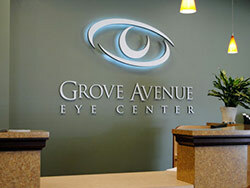 In addition, we create and fabricate any kind of sign you need. Your signage will be custom designed; unlike anyone else’s. This leads us to another important aspect of creating a landmark: uniqueness. Landmark signage is unique and “the same” all at once. But what does this mean? Your signage should stand out from the competition. However, if you have more than one location or franchise, you want to deliver the same message and maintain consistency. This is why it is so important to choose the right sign professionals for the job. Your beautiful signs can light up the night sky and serve as a beacon for daytime customers in Thousand Oaks, Oxnard, Santa Monica, Los Angeles and many other locations at the same time. There is no need to cram a great deal of information into your signage. In fact, some of the most dramatic and effective advertising is simple, straight and to the point. For an example, take a look at the channel lit letter sign we did for Domino’s in Carpinteria. A large image of a domino and the word “Domino’s” tells customers, “This is where you can get great tasting pizza”, and that’s all you need to know. This is a photo of the Domino’s illuminated channel letter sign fabricated and installed by national sign company, Dave’s Signs. This Domino’s is located in Carpinteria, CA. When you go big, it’s the little things which matter the most. For example, your signs in Thousand Oaks need to be placed at just the right height and have the right kind of lighting. Dave’s Signs can provide you with the perfect business signage and see to all the details, including installation and sign fabrication with a huge variety of options.